We're happy to announce that with the 3.2 GA of the core framework, several internationalization enhancements have been introduced that will make it easier to work with i18n messages, forms, translations, and addresses. In addition to our core framework enhancements, we've also created a separate module that adds even more more i18n features to help you manage your global eCommerce site. When you include the i18n Enterprise module in your project, you will get a new section in your Admin console that will allow you to manage all your internationalized translations, messages, and forms in one convenient place. Let's face it, nobody likes to fill out forms online. 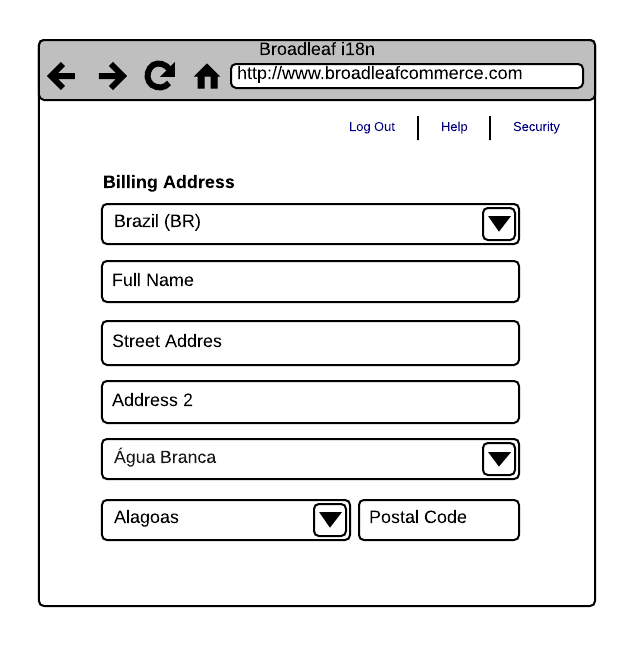 Studies have shown that checkout forms which are simple and offer the lowest resistance have the highest conversion rates. This is obvious. 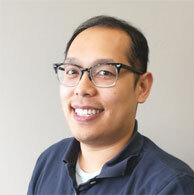 However, what may be less obvious is that forms that are considered "easy" and "simple" for a user in one country, may not be "easy" for a user in another country. There was a good article online that described some of the falsehoods many programmers believe about Address validation. Did you know that Ireland does not use a Postal Code? (although this is supposed to change soon as there are plans to implement one in Spring of 2015 http://en.wikipedia.org/wiki/Postal_addresses_in_the_Republic_of_Ireland) In fact, there are over 50 different territories all over the world that don't use a postal code. 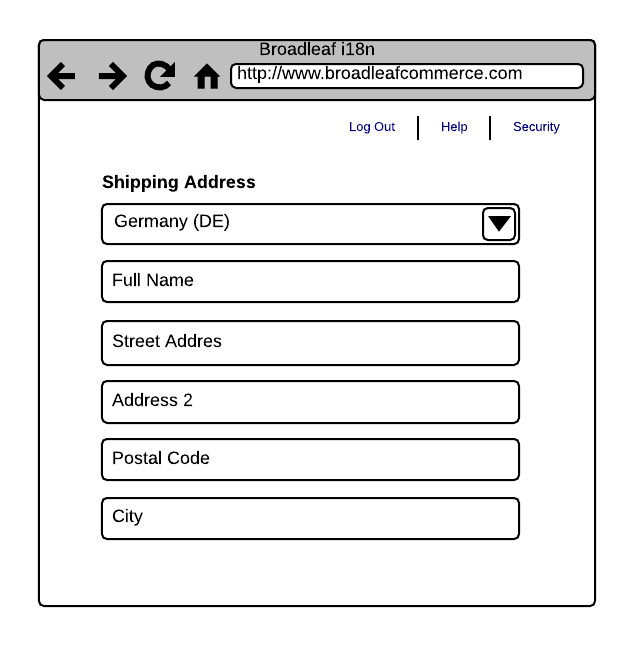 How many times have you seen an address form that supposedly allows you to ship anywhere around the world, but the postal code field is required? What about forms that ask for a first and last name that are both required? Many spanish-speaking people commonly have two family names. Many people in southeast Asia have only one given name. How do people usually deal with forms that are catered to a specific cultural standard that don't apply to them? In most cases with frustration and fake data. In some cases they just give up and abandon their cart. How would you feel if you were trying to purchase something online, but couldn't figure out how to ship it to yourself because you couldn't get pass the address form? Consider the fact that there are over 240 countries and territories, 140 different address formats, 6000+ languages written in various scripts, and over 40 personal name formats. Building a simple generic catch-all form to handle this can be daunting and in most cases wrong. This gives you the ability to take into account local and cultural norms, as well as the order of fields that are standard to a particular region. 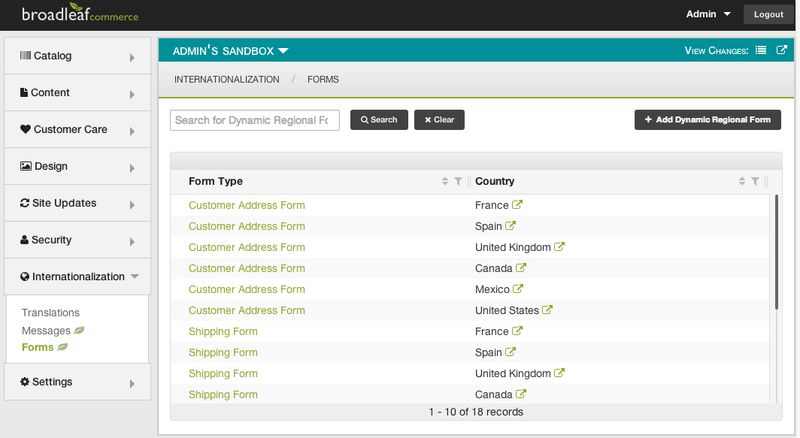 You will be able to easily add, remove, and order the fields on this form directly from the Admin. The i18n Enterprise module also gives you the ability to easily manage all the Translations and Messages of your eCommerce site through the Admin. The difference between a translation and a message in our system, would be that a translation is a field that is user generated and can be managed in the Admin. An example of a Translation would be something like a Category name or description field. You can enter the name of the Category in English, but also associate that field value to a localized translation as well. A message on the other hand, is defined as a localized string that is known at compile time. 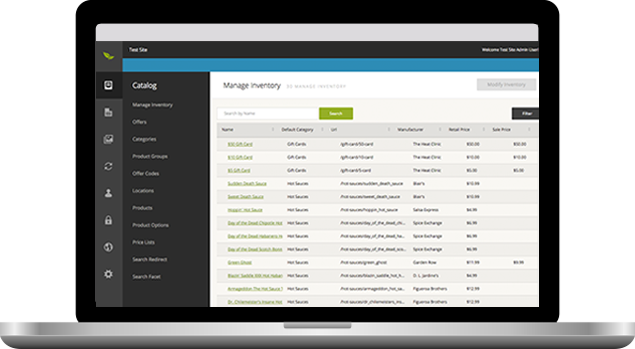 Messages are currently handled through the use of Spring's Message Source and ResourceBundles. By including this module, you can intercept this and store all your localized messages in the Admin (Database). If there is a resource with a locale string that matches in the database it will use that one first, otherwise it will fall back to the default Spring Message source resolution. This way you can dynamically add messages without having to do another deployment! We hope with these enhancements, you can build and maintain your international eCommerce site more easily and effectively. In the meantime, keep a look out as we continue to improve our i18n offerings!